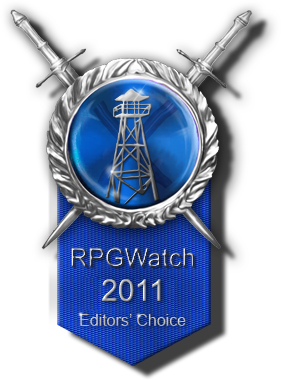 For almost one week you could vote for the Best RPG of 2011 and we now present you the results of the RPGWatch editors and your votes. Freedom. North, south, east, west, explore those ruins, trek around the coast line, collect books, impress the Jarl, buy a house, go hunting. For some, Skyrim is the greatest RPG ever made, while for others, it's not even an RPG - but for so many, the sheer enormity of content in a huge open world is utterly compelling. They aren't perfect but like no other games, the Elder Scrolls games allow players to live in a fantasy world. Skyrim improves on Oblivion in almost every way: the level scaling is better (though still flawed), the art direction is beautiful, the setting has a sense of history, lore and place. The dungeons are much improved, the scale of the landmass more realistic. Real mountains! Real waterfalls! It lacks the interesting factions of Morrowind but otherwise comes close to matching Bethesda's classic. It's still a modern Bethsoft game: the characters are mostly forgettable - even the ubiquitous Lydia is blank - the factions are clubs open to anyone and the world is static, without reactivity. But that huge, open world and the future possibilities of mod projects…Skyrim is a deserved winner for providing a world full of potential. Skyrim and The Witcher 2 were always the behemoths in this year's cRPG landscape, though in many ways, The Witcher 2 is the diametric opposite to Skyrim: a preset protagonist, tightly scripted, densely packed with plot, politics and scheming characters. The game is stunningly beautiful, showing off both CD Projekt Red's superb art direction and also their technical skill with sharp textures and effects. The scripting is complex and dense with the player scrabbling to keep up with the twisting plot. 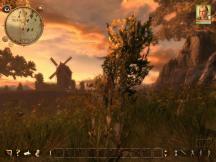 The Witcher 2 featured a completely new direct-action combat engine and the skill system was revamped. As with the first, The Witcher 2 featured a number of major decisions with significant consequences - the biggest resulting in a significant chunk of the game being entirely different, which is a major achievement. Over the years many developers have commented on the costs of making content players might not see, so CD Projekt's decision is to be applauded. Beautiful, visceral and a modern example of choices and consequences - The Witcher 2 polled strongly to take second spot. Drakensang developer Radon Labs' demise was one of the big tragedies in recent RPG history. Against the trend Drakensang was a slow, party based game with an incredibly deep character development system (The Dark Eye) under its hood. 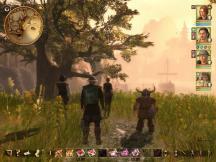 Where other games provided a quick fix, Drakensang offered a slow but steady build-up over 70+ hours. It became a surprise success. Sales were good, gamers liked it - at least those who weren't left behind in the boring tutorial level. A prequel was greenlit, aiming to improve on all of Drakensang's weaknesses. But then everything collapsed. Sales were slow, funding for Drakensang 3 fell through, Radon Labs had to close. The core part of the team found a new home at browser game giant Bigpoint. They're working on Drakensang Online. We'll probably never see Drakensang 3, and it's entirely possible Drakensang: The River of Time was the last non-indie party based RPG in the classic sense for a long time. A tragedy indeed. 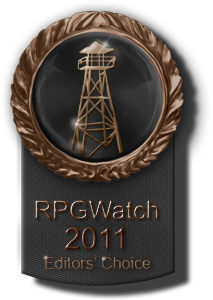 Like the RPGWatch editors, our gaming visitors also voted for Skyrim to be the best game released in 2011. 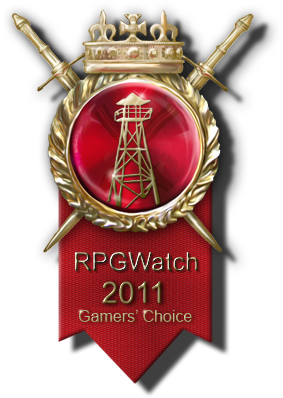 And our visitors also voted the same as the editors when it came to the runner up: The Witcher 2. We watched the development of Deus Ex: Human Revolution with cautious optimism. The developer consistently said the right things, explaining they had carefully examined the original game and maintained both the philosophy and core gameplay. Still, how many modern sequels truly embrace the original games without dumbing down and grasping desperately for new audiences? And surprise, Deus Ex: Human Revolution did stay true to the original game. The combat, stealth, hacking and social paths were all in place and solidly designed, still offering that special combination of dystopia, shooter and RPG elements. Perhaps it didn't quite reach the heights of the classic original - the levels, while not exactly cramped, didn't offer the same sprawling opportunities and iconic landmarks and the boss fights didn't fit the theme - but Deus Ex: Human Revolution was a fine game that, for once, kept the spirit of the of the original.